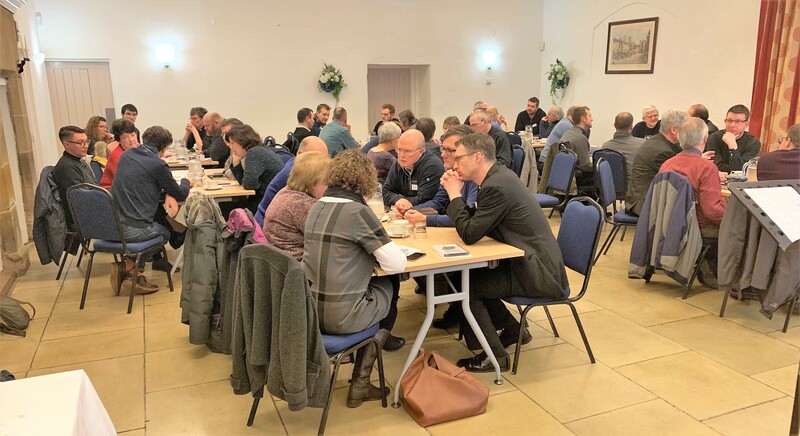 The latest clergy study days are currently getting to grips with the theme of ‘generosity, gift and grace’ in the context of discipleship; with ‘whole-life discipleship’ being an important focus of our work as a Diocese in the coming years. Find additional coverage of the Study Days in the February edition of The See, our diocesan magazine, distributed to most parishes. The study days for our clergy are taking place on five days in January and February and the first event was at Whalley Abbey on January 10 (pictured above). The next study day is on January 31 at the Hallmark Hotel in Leyland. More than 40 clergy attended the Abbey day; with 150+ booked in to attend all the events so far. Bishop Philip hosted and introduced speakers including Bishop Julian, Archdeacon Mark and the Dean, Peter Howell-Jones. Bishop Philip said: “Stewardship leaflets often start with a straightforward request for money, perhaps to fix the roof … but that approach doesn’t motivate generosity. Instead, our starting point should be what Jesus has done for us. “Giving is not about ‘propping up’ an institution. It’s about our relationship with God and we should be looking at the whole concept of giving in a different way. Building on this, The Dean told a powerful story about an early Christian encounter, before he came to faith, when he saw the mother of a friend put £20 – a huge sum at the time – into the collection plate. The impact of witnessing her quiet and selfless generosity stuck with him, long after the service itself was over. Bishop Julian followed the Dean and said: “The attitude with which we give is almost as important as the gift itself. Often there is a tendency to pride when giving when in fact it is our privilege, and not a duty, to give to God; and we should do so with a cheerful heart. Bishop Julian gave the example of his former parish of Claygate in Surrey where, following a spike in giving to support a church project, the congregation was invited to rethink their regular giving – leading to a long-term increase of 50%, based on the level of giving before the project. Meanwhile Archdeacon Mark encouraged the thought that giving can be an adventure … and you can read more about this thinking in his column on page 3 of the February edition of The See. To help clergy and parishes in relation to generosity, gift and grace, a whole host of resources are also now available on the stewardship pages of this website.